Posted March 27, 2018 by Martin Slater & filed under Services. As a first time ACS delegate and speaker, and first time visitor to New Orleans, these were pretty awesome firsts! And for different reasons both eye opening. The cacophony of night life and live music on Bourbon Street contrasted with the splendour of Royal Street and Decatur Street architecture and many excellent cafés and restaurants. This, together with the hefty pace of an almost overwhelming barrage of scientific presentations, posters and exhibitors, was both exhilarating and exhausting. Relaxing in my hotel room, as the sun glittered off the wide Mississippi below, I could reflect on the week’s events. Here are some of the highlights for me. We presented in the CINF fragrances, food and cheminformatics session, work we have done to classify odorants using shape and electrostatics generated using the XED force field 1. The less intuitive relationships between structure and olfaction, which are often not correctly attributable using 2D similarity techniques, are adequately described by a 3D field and shape treatment. In COMP, our poster on the addition of user defined pharmacophoric features to Blaze 2 (giving an additional way for users to influence the results beyond pure electrostatics and shape) received a lot of interest – particularly in the pros and cons of doing so. These new features were released in Blaze V10.3. One key issue in flavour & fragrance science is the absence of a really robust biological readout for quantifying odour perception. Jack Bicker (IFF) 3 and Joel Mainland (Monell Chemical Senses Center) 4 both discussed the ability to predict the intensity of odorants, and to reconstruct something akin to a full dose response curve, by manipulating ‘odour perception data’ collated from human panelists. Jack covered a range of predictive modelling techniques used for analysing both property and structure data for odorants. Joel Mainland’s remaining time focused on the results of the ‘Dream challenge’ which provided details of sensory data on a series of diverse odorants and invited ‘participants’ to predict the variety of odorant properties from structure alone. Surprisingly, this appears to have been most successful via recursive partitioning techniques. Over the whole ACS there was a revival of interest in GPCRs as targets including Merck presenting on CBR1 5, CCR2 6, GPR40 7 8. All very much on the back of advances in obtaining x-ray crystallography for this important family of proteins. Oliceridine as an agonist of the μ-Opioid receptor, a brand new drug for quite an established target, was presented by Trevena 9. One of the key issues with the use of agonists of this receptor (e.g., morphine), which behave pharmacologically as analgesics, is an associated respiratory depression effect. Trevena developed their medicine specifically to avoid this side effect and were able to do so by optimizing the drug specifically for the beta arrestin signalling pathway. Figure 1: Oliceridine in the context of μ-Opioid receptor PDB: 5c1m using Forge to align it to the original bound ligand from this PDB structure.Similarly, this notion resurfaced during Merck 5 and Lilly 6 talks on the effect of glucose lowering for diabetes via engagement with the GPR40 receptor. Again, biased signalling was associated with achieving a beneficial outcome. Lilly described the observed relationship between off rate and signalling bias – suggesting that increasing ligand residency time was associated with an increased engagement of the beta arrestin pathway. 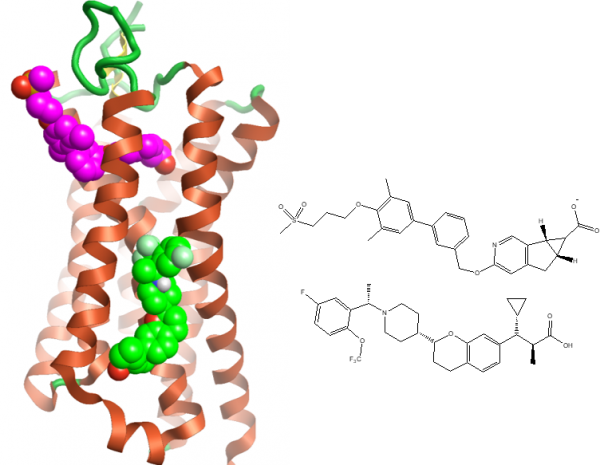 However, in this case the relationship between SAR and the pharmacology is complicated further by the observation of two distinct allosteric binding locations for the GPCR ligands. Figure 2: Merck’s two allosteric ligands bound into the GPR40 receptor PDB: 5tzy with the ligands shown in space fill (top structure magenta and bottom green).Thus, the portfolio of allosteric binding sites for GPCRs is duly expanding (numbers in parenthesis); with B2AR (2) GPR40 (2), CCR9 (1), ACM1 (1) all showing allosteric sites including a number where protein lipid interfacial contacts are made with the ligands. New targets (to me at least) described in the various medicinal chemistry talks include, to mention a few: APOBEC3 10, VMAT2 11, HPGDS 12, Ketohexokinase 13, SH2P 14 and CRB 15. Also, in particular, the DUBS and their corresponding ligase counterparts, which together control ubiquitin mediated signalling, received lots of attention. For instance, a fascinating talk from Michael Clague at Liverpool University’s Cellular and Molecular Physiology Department 16, inferred that USP30 has a potential role in neurodegenerative disease. USP30 is involved in regulating mitochondrial autophagy via modulation of the extent of ubiquitin labelling of external membrane proteins on mitochondria. COMP 192: Adding pharmacophores to shape and electrostatics – too much of a good thing?